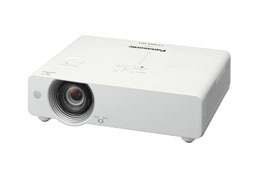 The Panasonic PT-VX605NU XGA LCD Projector provides 5500 lumens of brightness and a 5000:1 contrast ratio for clear, bright presentations - even in rooms with lots of ambient light. It features XGA 1024 x 768 native resolution, a three-chip transparent RGB LCD projection system and an Eco mode that supports a long lamp life of up to 7000 hours. This ensures a lower overall total cost of ownership. The PT-VX605NU features Panasonic's Daylight View Basic technology as well. For added convenience, the PT-VX605NU features wireless connectivity for wirelessly projecting from a PC or from your iOS or Android mobile device. It's equipped with USB connectivity that supports USB display functionality and USB memory viewing for PC-less projecting. This model supports Miracast device mirroring as well. The projector also provides a variety of other connectivity options including HDMI, dual VGA computer ports, a microphone input, and more. There's also an Ethernet jack for network connectivity, which supports PJLink, Crestron, and AMX compatibility. Plus, LAN connectivity allows for remote control of the projector from a network-connected PC. The projector has an audio output jack for exporting audio to external speakers. Other features include a built-in 10W mono speaker, a serial RS-232C terminal for external control, and a powerful 1.6x zoom lens. The unit is compatible with NTSC, PAL, and SECAM video systems as well. This portable LCD projector features XGA 1024 x 768 resolution. The compact and lightweight projector outputs up to 5500 lumens of brightness that brings colors to life, adding punch and realism to presentations in well-lit rooms. This model produces a barely audible 29 dB in Eco Mode. Your audience won't have to strain to hear in quiet scenes or be distracted by unwanted noise. With a high 5,000:1 contrast ratio, viewers can expect deep blacks, pure highlights, and crisp, easy-to-read text and graphics. Daylight View Basic prevents the picture from washing out in bright rooms by sensing ambient light levels and adjusting the picture accordingly. Halftone color and brightness are automatically optimized to make images sharper and brighter in any environment. This projector lets your team share and collaborate from iOS and Android devices as well as from Windows and Mac computers, with streamlined 3-step connection for quick and easy wireless projection. The built-in wireless LAN unit supports 2.4GHz IEEE802.11b/g/n and 5.0GHz IEEE802.11a/n infrastructure modes. Connect any Miracast-compatible device and mirror whatever is on your screen, from Full HD 60Hz video to websites and PowerPoint documents. Download free apps for iOS and Android devices and project a wide range of media quickly and easily. Transfer data from the screen of your PC or laptop via wireless LAN using Wireless Manager ME 6.2 software, which features a novel interface design for faster connection. Plus, Multi-Live Mode enables simultaneous projection from up to 16 computers in split-screen mode. Plug the optional Easy Wireless Stick into your PC's USB port and project a wide variety of content-no app installation required. You don't even need to a smartphone or PC to start projecting. USB Memory Viewer is a convenient way to project stills and video stored on USB memory devices, with MOV, AVI, MPG4, WMV, JPEG, and BMP files all supported. An additional USB port is included for PC connection. Developed using HDBaseT technology, the DIGITAL LINK connection routes uncompressed Full HD video and Ethernet/RS-232C control commands through a single cable for distances of up to 328' (100m). This greatly simplifies installation (especially when the projector is incorporated into an existing network or control system) while saving money on cable cost. Lamp replacement cycle of 7000 hours and a max filter life of 7000 hours. This means that when maintenance is eventually due, you can replace both the lamp and filter at the same time, even with the projector mounted on the ceiling. A Vertical Lens Shift function allows you to move the image up or down without distorting the picture. This is useful for quick image corrections in portable applications. Horizontal, vertical, and corner keystone correction adjusts the image shape when projecting off-axis or from an unusual angle. Should the vertical projection angle be altered during operation, real-time keystone correction senses the change and makes any necessary corrections for optimal viewing. This model plugs into existing projection networks controlled by Crestron Connected, PJLink Class 1, and AMX software. Multi-Projector and Monitoring Software enables control of multiple projectors from a PC. A variety of projection distances are possible using the 1.6x zoom lens function. You can position the projector anywhere from 7.8 - 12.7' (2.4 to 3.9m) from a 100"-wide screen for large-format pictures in small, medium, or large rooms. Whether you're planning to install your projector on the ceiling or take it with you to a meeting, a generous selection of input terminals are included to connect a variety of source devices. These include two HDMI terminals and two RGB D-Sub ports for PC connectivity.